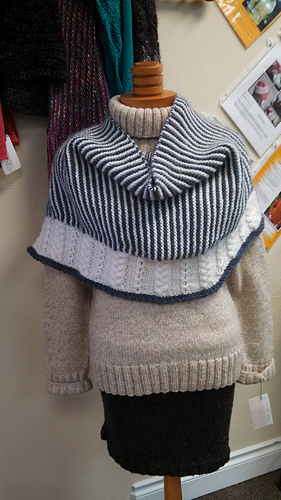 Wrap up in this cushy shawl and enjoy all the cooler weather has to offer. Brazos Valley is generously sized and made out of dreamy baby alpaca for maximum comfort and warmth. Whether you are cuddling up next to the fire or in need of something snug for a hay ride, the Brazos Valley Shawl will do the job. The main section of the shawl is knit side to side, then a lace and cable pattern is added along the bottom edge. A perfect shawl for fall.